episode series that adapted the Halo: Fall of Reach comic, which itself was an adaptation of the very first Halo novel. I’ve watched all 4 of these series, and each one of them has since been cut into 4 films. I feel it’s important to look at these series and see how well Microsoft and 343 Industries have been handling the expanded universe content outside of the games. The first live action web series produced under Microsoft and 343 Industries, Halo 4: Forward Unto Dawn served as a prequel to then upcoming Halo 4, the first numbered Halo title since Halo 3 in 2007. 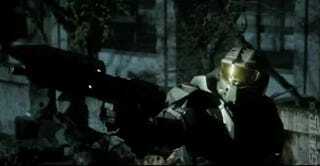 The goal of the film was to introduce Thomas Lasky, a character that would feature in the upcoming game, and explain his connection to the series main character, John-117 or the Master Chief. While a few of the characters, Lasky included, come off as decent enough, it’s hard to get attached to characters you’ve only just been introduced to. And, as is to be expected, they all begin to die off one after the other until only Lasky and two others remain to fight another day. The only reason they get that far is due to the timely intervention of the Master Chief who rescues them and then leads them to safety. For his first live action appearance, the Master Chief is well presented. The armor looks great and his height, 7 feet tall, is accurate. His voice isn’t the same due to this being a budget production, but it sounds similar enough, especially considering this is a younger Chief, that it works. He honestly steals the show when he appears on screen, sort of overshadowing the actual main characters at times. For a budget production though, it looked and sounded great, though the Halo 4 Covenant that made their way into the movie could be jarring for anyone that was expecting the older models to be used since it was set in the past. This is a small criticism though for what is honestly a fairly decent series. And while it definitely gives Lasky some backstory, the connection he has with the Master Chief is honestly minimal and is played up probably far more than it should be in the game this is a prequel to. Like Forward Unto Dawn, Nightfall was meant to introduce a character to fans and set them up for their appearance in a future Halo game, this time Halo 5: Guardians. The character in question is Jameson Locke, an ONI operative sent to neutralize the source of a nasty chemical agent which just so happens to be sourced from the shard of a Halo ring. Also like Forward Unto Dawn before it, Nightfall has a slight horror twist though possibly more so, and as a result, only two characters make it out this time. Bet you can guess at least one of those survivors. Depending on who you ask, you’ll probably get a variety of answers about how good or bad this series was. Locke was arguably a far better character in this movie then he was in the entirety of Halo 5. On the other hand, the plot of the movie seemingly had very little to do with anything and the whole reason for their mission was pretty much forgotten about not long into the movie once the main antagonist came into play. You could argue that this is the worst of the two live action films. Still worth a single watch but going back for seconds likely isn’t in the cards. A more advanced motion comic than the Terminals that came before it, Fall of Reach adapts a small portion of the original Fall of Reach story, beginning with the child abductions and initiation of the Spartan-II program, and ending with the battle above Chi Ceti IV. The actual Battle of Reach does not feature in this film. However, that was never its intended purpose and is perhaps being saved for another day as many fans want to see the full story adapted. I admit, I’m glad it wasn’t because the animation in this movie can vary from good to stiff at the drop of a hat. Motion comics aren’t exactly the best medium for such endeavors it would seem. However, this one is definitely one of my favorites as it feels like Halo, a return home to the old Bungie days. I don’t necessarily hate what 343 Industries has done, and their influence can still be seen in this film with the Spartan’s wearing early versions of their Halo 5 armor and the Covenant using their 343-era designs, but the story itself, the writing remains as good as it once was and shows of the rise of the Master Chief as the de facto leader of the Spartan-II’s. It shows why they follow him without question and how he became the man we see in the games which take place long after these events. The purpose of this film was to introduce Blue Team, the Master Chief’s personal Spartan-II unit, who had their first video game debut in Halo 5: Guardians. 343 Industries anticipated that a lot of fans wouldn’t be familiar with Blue Team, so they had this series made to rectify that, at least to some extent. At only an hour long, this one I highly recommend to everyone. Out of all four current movies, Halo Legends is sort of like the black sheep of the bunch. Being a western developer, owned by a western publisher, you’d never expect Japanese animation studios to be contracted to create something like this. But that is exactly what happened and it happened before any of the other films. What we got was a collection of eight episodes, each averaging about 15 minutes, and each with a different story and animation studio. The goal was to serve as sort of an anthology collection, to tell multiple stories from across the Halo universe. From the history lesson of Origins, to the birth of the Covenant in The Duel, the Dragon Ball-esque shenanigans of Odd One Out, and the CG visual feast of The Package. There’s a story for everyone in this collection and every story is worth seeing at least once. And all the stories are canon except for Odd One Out for obvious reasons.